Best movies 2015: Dana Stevens’ picks, including Inside Out, Spotlight, and more. 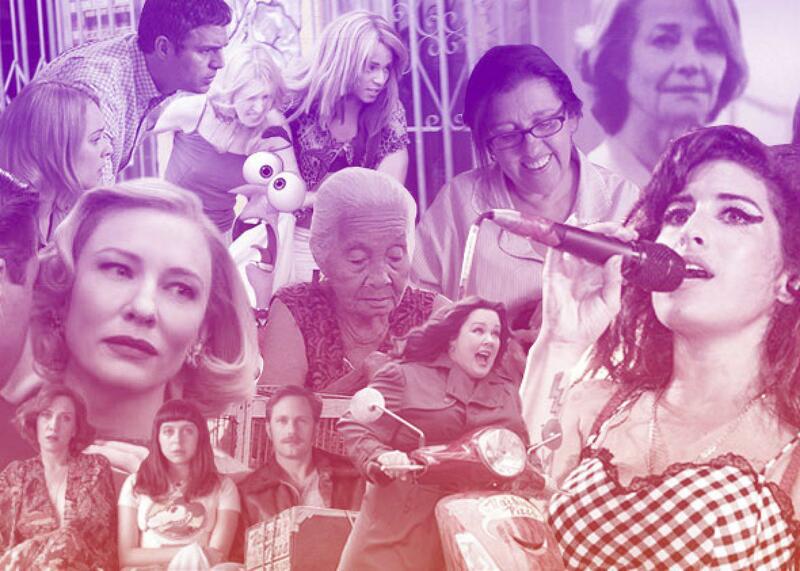 The year in cinema is an overwhelming banquet. Here are my 10 favorite dishes. Image by Slate. Photos courtesy of Magnolia Pictures, Twentieth Century Fox, Kerry Hayes, Open Road Films, Drafthouse Films and Participant Media, Wilson Webb/the Weinstein Co., A24 Films, and Disney/Pixar. Given the few hundred movies that now come out each year (and that’s just counting “wide” releases, a term that has less and less meaning given the rise of alternate viewing platforms), even the most omnivorous movie consumer can no longer keep up with the release calendar. The film marketplace has become a lavish international banquet, with tantalizing-looking offerings from around the world sailing past faster than you can grab them off the platter. (As at real banquets, though, the most delicious delights are sometimes the hardest to snag, and you sometimes find yourself stuck with a congealing slab of salmon, aka a disappointing mainstream release.) In alphabetical order—because ranking one’s beloveds seems too cruel—here are my 10 favorite titles of the year, plus five more to grow on. 45 Years. In Andrew Haigh’s follow-up to the acclaimed Weekend, Charlotte Rampling and Tom Courtenay—both astounding—play a happily married couple that is about to celebrate the anniversary of the title when a letter arrives that changes everything. This is one of those rare films in which intention, form, and execution come together perfectly: Every light-flooded frame is a painting, and every line of dialogue unfolds a new dimension of the film’s central relationship, which remains ambiguous up to the last frame—just like life. In theaters Dec. 23. Amy. How to avoid Behind the Music–style clichés about addiction and fame, in a film about a woman whose rapid rise and steep decline seems to invite exactly that approach? How to make use of extensive cellphone footage from Amy Winehouse’s childhood friends without betraying their privacy? And how to show audiences familiar only with Winehouse’s now-tragic hit song “Rehab” why she mattered, not as fodder for tabloid prurience, but as a musician? Asif Kapadia, the director of this intimate, lyrical, and haunting documentary about the troubled R&B singer, makes all these tough calls exactly right. Now on DVD and streaming. Carol. Todd Haynes’ exquisite adaptation of the Patricia Highsmith novel The Price of Salt—a lesbian romance that had to be published under a pseudonym in its day—is an appropriate favorite movie for the year the Supreme Court made marriage equality the law of the land. This existential coming-out story unfolds almost entirely inside the head of its naive shopgirl heroine (Rooney Mara) as she falls for an enigmatic married woman (Cate Blanchett) whose unconventional approach to life seems to suggest the thrilling possibility of a world where, one day, you could love anyone you wanted. In theaters now. Diary of a Teenage Girl. I put off seeing Diary of a Teenage Girl for months, because the subject matter—a 15-year-old growing up in 1970s San Francisco gets involved with her alcoholic mother’s skeezy boyfriend—sounded harsh and depressing. No words could be less descriptive of this joyful, compassionate, funny female coming-of-age tale, a triumphant debut for writer-director Marielle Heller and a ravishing breakthrough for the 23-year-old English actress Bel Powley. On DVD Jan. 16. Inside Out. This high-concept Pixar outing—in which a preteen girl’s brain is envisioned as a control board manned (and womanned) by squabbling, scrambling anthropomorphized emotions—had the unprecedented effect of making both me and my 9-year-old daughter cry in a movie. (Unprecedented for her, at any rate; she scorns my frequent weeping in theaters.) Just as important, it made us both laugh a lot, and go home thinking in a new way about the function of emotions in our daily lives. Sometimes she still asks me to drag her around the living room by one foot while she reflects, in the Eeyore-like voice of Phyllis Smith’s Sadness, “Actually, this feels kind of nice.” On DVD and streaming. The Look of Silence. Joshua Oppenheimer’s follow-up to his acclaimed 2012 documentary The Act of Killing is the extraordinary record of the more than 10 years Oppenheimer spent filming an Indonesian family in an attempt to understand what happened to their son during the government-sanctioned massacres of 1965-66. It’s The Act of Killing’s reverse side—as introspective as that film was flamboyant, but equally nerve-shattering. Now streaming. The Second Mother. Regina Casé—a well-known soap actress and talk-show host whom I called in my review “the Oprah of Brazil”—owns this movie the way Liza Minnelli owned Cabaret. The uncontainable force of Casé’s personality animates this character portrait of a live-in nanny in an upper-middle-class São Paulo home. But writer-director Anna Muylaert makes us sympathize not only with this beleaguered domestic employee, but with her rebellious daughter and even her employers—who, for all their best intentions, can’t get outside the colonial hierarchies that determine even their closest relationships. Streaming now. Spotlight. Tom McCarthy’s journalism procedural doesn’t just reconstruct the Boston Globe’s groundbreaking 2001 reporting of the Catholic priest abuse scandal, right down to the last Post-it note and follow-up phone call. It does something not many Hollywood movies dared to do in 2015: It slows down, making us privy to every editorial-meeting debate and red-tape-related delay, so that when those damning headlines go to press in the final montage, you understand exactly how much effort, dedication, and courage it took for the good guys to prevail this time. In theaters now. Spy. I wondered whether this bantamweight spy spoof, directed by Paul Feig and starring Melissa McCarthy as a bureaucratic pencil-pusher turned secret agent, was “important” enough to appear on a year-end list. But it feels major that this feminist take on the Bond genre not only talks the talk about foregrounding female camaraderie, but walks the walk. And Rose Byrne, as a Bulgarian mobster’s daughter with a deliciously vulgar wardrobe and a talent for over-the-top insults, gives one of the funniest supporting performances of the year. Streaming now. Tangerine. Sean Baker’s slyly inventive film, shot on an iPhone 5S, follows a pair of transgender prostitutes through the sketchier parts of L.A. over the course of one long, loopy, trash-talk-filled Christmas Eve. Though so much about this film speaks to the future—its mode of filming, its vision of gender and sexuality—Tangerine is at heart a simple comedy about an age-old theme: the betrayal and reparation of a friendship. On DVD and streaming now.